While I don’t mind eating bland and/or unhealthy food for the odd night or two, if I’m planning to do a 2-6 week trip I want to eat healthy and I want variety. Also I’m happy to have a warm cooked meal at nighttime but the last thing that I want to do is get my stove out during the day so wraps, jerky or stove less meals and vegetables form an integral part of my lunches. I remember trawling online for dehydrated vegetables early last year for a trip and having very little choice. Deb instant potato or dehydrated peas from the supermarkets, and three vegetable mix from the specialist stores has been the staple of the Australian camping set for a number of years. The instructions on the packet are easy to follow. You can add them to your meal and stir them through or else cook and cover them in boiling water for approximately 2-5 minutes, seasoning to taste. They serve their purpose well as a meal addition or side dish. 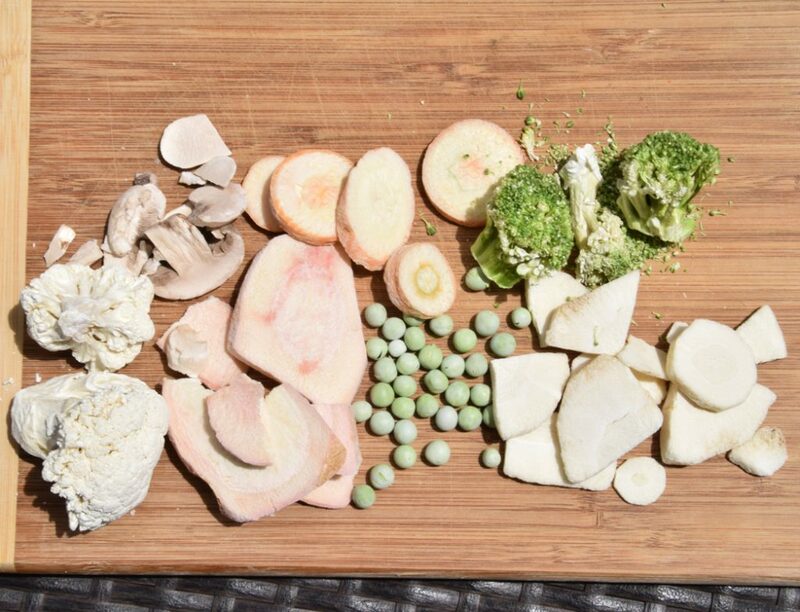 My focus for Australian Hiker is not on preparing meals on the trail but in lightening the load and providing no cook, stove less, or preprepared options and these vegetables lend themselves to this concept. My first attempt of adding boiling water in the same manner as freeze dried camping meals worked well. I mixed different types of vegetables and with the expectation of the potatoes, which are physically larger, the rehydrating time was adequate. I also tried soaking in cold water for 90 minutes with some olive oil and this also worked well. As with most stove less meals the addition of spices would not go astray, as plain vegetables can be a bit bland at the best of times (follow this link to one possible recipe). As far as the taste and texture goes these are what they are advertised as ‘Vegetables straight from the farm, snap dried’. They taste like you would expect and not some plastic simulated version. Although the beans were sold out when I made my purchase, I tried the rest of the range and enjoyed them. Gill however found the parsnip to be bitter but I think that for many people parsnip is an acquired taste. In regard to negatives there are very few. The main one specific to this range is that they are dearer/gram than the mixed vegetables from Backcountry Cuisine however the wide range more than makes up for the cost difference. I am more than happy to recommend this range of Campers Pantry vegetables to traditional campers who cook their meals on the trail or the minimalists who don’t want all the fuss. Two year shelf life, or one week when opened. That means they will last most hikers the length of their trip. No wastage!